Our first Maraween event has started. The Pot of Gold has been magically transformed into the Pumpkin of Gold. Until November 12th, only Halloween Treats can be donated. You can pick up one item from the Pumpkin of Gold every 5 minutes. New prizes will be donated randomly throughout the day. There are 4 new prizes that will randomly be donated to the Pumpkin of Gold. These items will retire November 12th. There will also be lots of Halloween Treats donated and the chance to grab some old retired Pumpkin of Gold prizes! The Lottery has been drawn for this week. CollectionFox is the winner of the 762,800MP Jackpot with the winning numbers of 7, 17, 18, 27, 30 and 36. Congratulations! Fast Food is back under new ownership and can be invested in again. Shares are starting at 654MP. Last Week's Raffle has now ended. ZyuohTheWorld is the winner of the Red DNA and 100,000MP prize with the winning raffle ticket number 583865. Congratulations! Make sure you buy your tickets for today's raffle - only 10MP per ticket! The Game of the Week has changed to Domino and this week's Olympics Event is Hurdles. Voting has closed and a new Shop of the Week has been decided. For the next 7 days, the Fake Costumes shop has a 2 for 1 sale. Every time you buy an item from this shop you will pay for one and receive two. Vote Now for next week. All pets wearing a Glass Costume will receive Double Training stats this week at the Gym and Elite Gym. Vote Now for next week. All pets wearing a Pinata Costume will receive Double Education stats this week at the School and University. Vote Now for next week. We have SO much happening from now until October 31st, including Character Trick or Treat, Pumpkin Hunt, the Halloween Snowman, limited edition Account Upgrade items, Elger's Trick or Treat, Beelzebub, Pumpkin of Gold, the Halloween Alien and much more! Today is the 13th... a favourite number of a certain Halloween devil. Beelzebub has been seen lurking around the site again. We all know how much Beelzebub loves Halloween. As usual Beelzebub has all sorts of Halloween goodies to give away to members who are getting into the Halloween spirit and have a halloween-themed character or profile. There are 6 new prizes for 2018 and Beelzebub will also be giving out limited numbers of retired prizes from previous years. You dont have to have a Halloween costume for your character, just use your imagination and dress your character in some appropriate clothes and makeup to make yourself look appropriately spooky - just be creative! A new Double Scholarships Giftbox is now on sale at the Giftbox Shop. Use this item and you will earn twice as many Scholarships from the Aquarium for life. 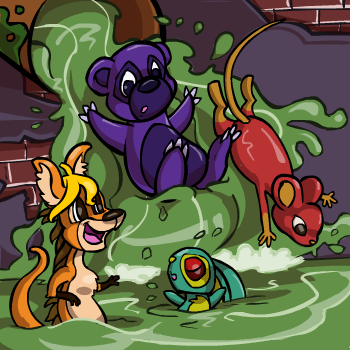 The Snookle, Speiro, Sybri, Tantua, Troit, Viotto and Vixen can now wear the Slime Costume. For a very limited time only, the Account Upgrades Shop has all of the old retired AU Trick or Treat Costumes on sale. You will receive a random costume and this offer will all automatically end October 31st. The costumes avaliable are listed below. A new Weekly Quest Contest has just started. This week's quest game is Shusan. The challenge is to complete as many of these Quests this week. The top 3 players at the end of the challenge will receive a Splatter Costume, 200,000MP and a Gold Trophy, the next 6 players will receive 150,000MP and a Silver Trophy and the next 9 players will receive 100,000MP and a Bronze Trophy. A new Carpenter Treasure Map is now on sale for BP at Rapunzel's Tower. Collect and complete all 16 pieces for FREE lifetime access to a new Carpenter quest that will be released in Foxfire Forest later this year. The map pieces can be used as toys but you will not be able to complete the map until the Carpenter quest is released. A new Weekly Battle Contest has just started. This week's opponent is Newth Knight. You will need to have a Newth Knight Trading Card in your Battle Deck. The challenge is to win as many battles against this opponent this week. The top 3 players at the end of the challenge will receive a Old Wizard Troit Trading Card, 200,000MP and a Gold Trophy, the next 6 players will receive 150,000MP and a Silver Trophy and the next 9 players will receive 100,000MP and a Bronze Trophy. There are 3 new Giftbox items now on sale at the Giftbox Shop. The Dukka Dash Giftbox allows you to play every 15 minutes instead of 30, the Bootleg Pyramid Giftbox allows you to visit every 4 hours instead of 8 hours and the Double Hieroglyphic Giftbox will give you double Hieroglyphic items at the University for life! Wanted Ads have been updated. The layout has been improved and looks similar to the Trades layout. When you view Wanted Ads for a specific item, the highest MP price will now show at the top. Wanted Ads will also now automatically cancel after 90 days or when a player's account is banned. When a new item is re-released in Account Upgrades we may now cancel all Wanted Ads for this item if we think that the price will become a lot lower. You can now browse through all Trades that have an Instant Sale Price. The One in a Million game in Lush Lake has been updated. This FREE to play game gives you the chance to win 1,000,000MP. Now if you guess incorrectly, you still have a chance to win a prize! There are 97 new Millionaire Plushies and Enchanted Millionaire Plushies for you to win from this game! The Lottery has been drawn for this week. MyraMeliodus is the winner of the 707,000MP Jackpot with the winning numbers of 3, 13, 16, 18, 22 and 45. Congratulations! Last Week's Raffle has now ended. greenfire6895 is the winner of the Red DNA and 100,000MP prize with the winning raffle ticket number 575448. Congratulations! Make sure you buy your tickets for today's raffle - only 10MP per ticket! The Game of the Week has changed to Blackjack and this week's Olympics Event is Hurdles. All pets wearing a Galaxy Costume will receive Double Training stats this week at the Gym and Elite Gym. Vote Now for next week. All pets wearing a Grey Costume will receive Double Education stats this week at the School and University. Vote Now for next week. 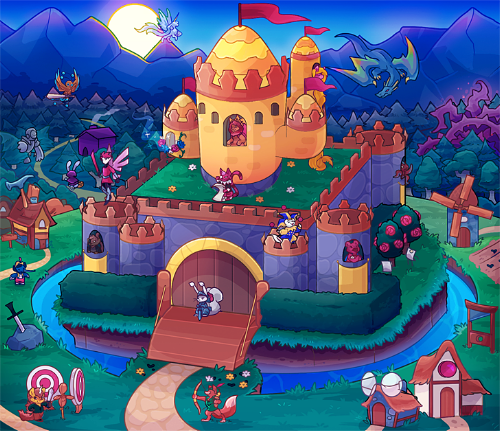 Baspinar's Castle world map has been updated. 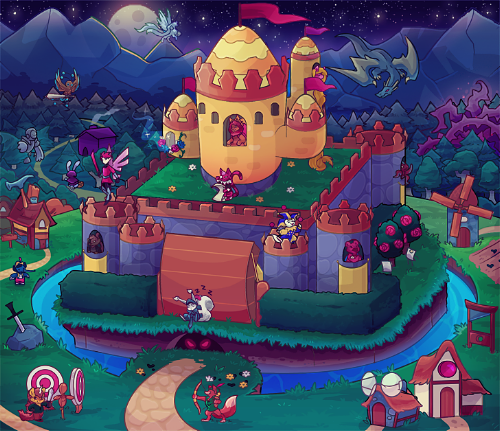 The inside and upstairs of the castle have been removed and everything has been placed into one map. You can see below the difference between the day and night versions of the map. This map was one of the original world maps and was over 13 years old. We hope you like the changes! Your Attic has two new features. You can now browse all items from a certain location/event or you can view all retired items in your Attic. There were 7 pets that were missing Dips, Enchanted Dips and Essences. These have now been released. The Witch Doctor has been updated. Just like the Hotel, you can now hire the Witch Doctor for up to 1 year of protection. Prices start at 10RP for the first day and 5RP for each additional day. Club Ranks now show at the top of your club so you can see your current rank name and position. Club Leaders can now limit the Club Raffle, Quiz, Shop and Swaps to a certain Club Rank and higher. You can use this feature to prevent new club members joining to take part in these features and then leaving. Club Points can be reset for all Club Members now. There is also the option to reset, remove or award Club Points to a specific member of your Club. There is also the option for the Club Raffle and Club Shop to be priced in Club Points instead of MP. This will be removed from their Club Points balance but will not decrease their Club Rank if they spend them all. Club Galleries have the option for items to be centred, just like the normal Galleries. Club Donations can now be disabled in Club Settings. Club Leaders now have the choice to stop any item or MP donations to the Club. All Dakota and Tasi pets will receive DOUBLE STATS at the Gym and Elite Gym until October 17th. All Pixel and Checkered pets will receive FREE TRAINING at the Gym and Elite Gym until October 24th. And all Pixel and Checkered pets will receive FREE LESSONS at the School until October 24th. The Arinya, Azul and Kronk can now wear the Sewers Costume and the Chibs and Newth can wear the Pixel Costume. A new Weekly Quest Contest has just started. This week's quest game is Simerian Explorer. The challenge is to complete as many of these Quests this week. The top 3 players at the end of the challenge will receive a Dark Costume, 200,000MP and a Gold Trophy, the next 6 players will receive 150,000MP and a Silver Trophy and the next 9 players will receive 100,000MP and a Bronze Trophy. There are 12 Microwave Recipes for you to discover. Complete Microwave quests for the cooking time and you can try cooking the matching two items that will cook one of these new items. The new items include two Musical Instruments, a Stamp, three Wardrobe items and more! Maraween season is fast approaching. Be sure to visit us this month to take part in all of the usual Halloween events including Character Trick or Treat, Pumpkin Hunt, the Halloween Snowman, limited edition Account Upgrade items, Elger's Trick or Treat, Beelzebub, Pumpkin of Gold, the Halloween Alien and much more! For a limited time only, the retired Halloween Treasure Chest and Eleka Treasure Chest from 2015 are back on sale at the Account Upgrades Shop. They will both automatically retire October 15th. The Addow, Crikey, Doyle, Grint, Huthiq, Justin and Leido can now wear the Sewers Costume. A new Weekly Battle Contest has just started. This week's opponent is Grinch. You will need to have a Grinch Trading Card in your Battle Deck. The challenge is to win as many battles against this opponent this week. The top 3 players at the end of the challenge will receive a Hot Dog Trading Card, 200,000MP and a Gold Trophy, the next 6 players will receive 150,000MP and a Silver Trophy and the next 9 players will receive 100,000MP and a Bronze Trophy. The September 2018 Monthly Checklist winners have been announced and the prizes have been rewarded. Congratulations to all of those who have won. Don't forget, this is a monthly permanent feature that you can enter for FREE. If you haven't already, it's time to start entering the October event! The Lottery has been drawn for this week. ducksoup is the winner of the 721,500MP Jackpot with the winning numbers of 3, 4, 8, 15, 20 and 41. Congratulations! Medicine is back under new ownership and can be invested in again. Shares are starting at 566MP. Last Week's Raffle has now ended. nickie415 is the winner of the Red DNA and 100,000MP prize with the winning raffle ticket number 563307. Congratulations! Make sure you buy your tickets for today's raffle - only 10MP per ticket! The Game of the Week has changed to Rofling Gold and this week's Olympics Event is Hurdles. Voting has closed and a new Shop of the Week has been decided. For the next 7 days, the Stamps shop has a 2 for 1 sale. Every time you buy an item from this shop you will pay for one and receive two. Vote Now for next week. All pets wearing a Calico Costume will receive Double Training stats this week at the Gym and Elite Gym. Vote Now for next week. All pets wearing a Minipet Costume will receive Double Education stats this week at the School and University. Vote Now for next week. The Sewer Pipes in the City Sewers has been updated. All players that have completed the Sewer Pipes Treasure Map and have access to this feature can now use the new and improved Sewer Pipes. The MP payouts have been increased and you can now earn between 1 and 3 Gym or Elite Gym Stats. There are 16 new Sewers Plushies and 89 new gourmet Minipet Poop items that can only be won from here. Another new prize is that your pet may receive between 15 and 59 minutes of Battle Immunity for your pet. 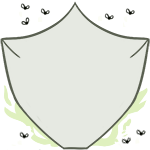 This happens right away and will give your pet a defence shield that will deflect any attacks your pet will receive in the Battle Arena allowing you to win battles against even the hardest opponents!